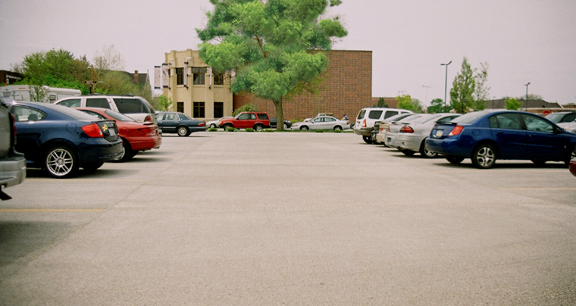 Project obstacles and solutions: The Purdue Research Foundation wanted to create a fully sustainable "green" pervious parking lot that would require no subsurface drain/sewer system, would allow surface water to percolate back into the ground and would clean the water of pollutants as it passed through the surface. The engineers on the project selected imix Eco Pave as the paving material. The site had previously been occupied by a fraternity house with a basement. The structure was razed and the old basement foundation was removed. Next, the hole was filled with 1-1/2" limestone and loosely compacted to create a good sub-surface base. The concrete and stone work together to provide a filter for the natural decomposition of grease, oil and other toxins. Over time, microbes feed on these trapped pollutants and break them down. The water is cleaner coming out the bottom of the stack than when it enters the surface as rainwater. "The real key to making any pervious concrete work is threefold," says Jim Shubert of IMI. "First, you have to make sure you know what kind of soil you have. In this case, the soil is very porous and allows good water runoff. Secondly, you need the right aggregate sub-base. It has to support the concrete, but it also has to have a void so the water has somewhere to go. Thirdly, pervious concrete is poured very dry and you have to know what you are doing or you will close up the surface and water won't be able to penetrate it." The photos on the right show the parking lot after a week of heavy rain. As you can see, it is dry with no puddles or pooling. The pint of water that is spilled goes right through the surface without any runoff. The Purdue parking lot was poured in 18 x 20' sections. The entire project included 212 yards of concrete and over 6,700 tons of aggregate. At capacity, the 1/3 acre parking lot will hold over 270,000 gallons of water. To find out how much water your project will hold, try our imix Eco Pave calculator, click here. To read more about imix Eco Pave and our other green solutions, click here.